Lionsgate's highly-anticipated action sequel John Wick Chapter 3 has added its first major new star, with Oscar-winning actress Halle Berry signing on for an unspecified role. While no specific details about the character have been given at this time, but sources did indicate that Berry is not playing the film's main villain. This falls in line with a report from January, which claims that the primary villain will be Hiroyuki Sanada (The Wolverine), the head of a Japanese crime syndicate who has a score to settle with Keanu Reeves' title character, but that has yet to be confirmed. That report from January also claimed the studio was looking for a woman to star alongside Reeves, with the studio casting a wide net, with an age range of late 20s to early 40s, but it isn't known if this is the same role that he 51-year-old Halle Berry had now landed. Keanu Reeves had also expressed interest in the past in bringing in his Constantine co-star Tilda Swinton, although Reeves didn't mention any specific role he wanted Swinton to play in this sequel, which is expected to be the final installment of the film trilogy. Production started late last month in Montreal, which is doubling for New York City, with the sequel also expected to shoot on location in the Big Apple, along with other locations such as Russia, Spain, Morocco and Jordan. The studio released an official synopsis for John Wick 3 at CinemaCon last month in Las Vegas, which revealed that there is a $14 million global contract out on his head, after the events of John Wick: Chapter 2, where he killed a member of the High Table at the Continental Hotel, breaking their cardinal rule of no killing at that establishment. Chapter Two's final moments feature Winston (Ian McShane) giving Wick a one-hour head start before he's labeled "excommunicado" from the Continental, barring him from all of the establishment's services. The synopsis also revealed an interesting tidbit, that Wick "uses the service industry" to stay alive as he fights his way out of New York City. McShane is believed to be back as Winston, along with a number of other characters from John Wick and John Wick: Chapter Two such as The Bowery King (Laurence Fishburne), Cassian (Common), Charon (Lance Reddick), Ares (Ruby Rose) and Aurellio (John Leguizamo). 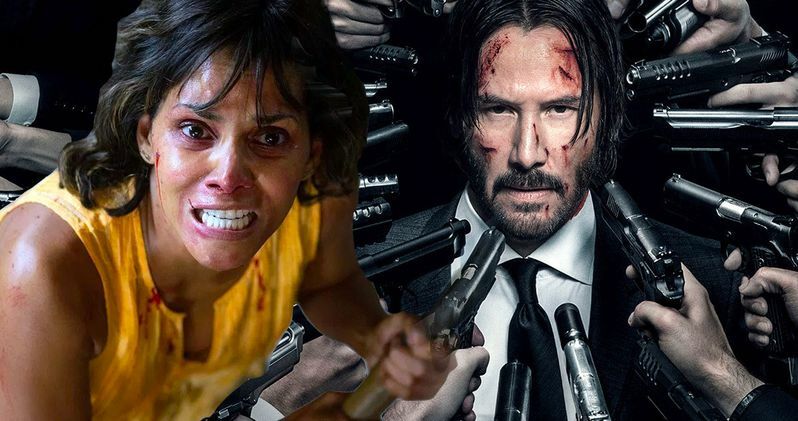 As for Halle Berry's character, if she is not playing a villain, then it's possible she could be a new ally to John Wick, but that has yet to be confirmed. Chad Stahelski, who directed John Wick with David Leitch and John Wick Chapter 2 by himself, returns to direct John Wick: Chapter 3 from a script by Derek Kolstad (John Wick, John Wick: Chapter Two) and new writers Chris Collins, Marc Abrams and Shay Hatten. Basil Iwanyk and Erica Lee are producing through their Thunder Road Productions, with Lionsgate setting a May 17, 2019 release date. The Hollywood Reporter broke the news on this casting earlier today.